The excitement is killing me. NOT literally, but I lack attention to any detail at the moment, since Saturday night I pick up my Knight In Shining Armor at the airport for his military leave. I would like to say that I have been rushing around getting all the stuff I needed to get done, before he arrives home for his 10 days, but I haven't. I have done the basics that were necessary, but I am too excited to put great concentration on any one thing. I have tried to make sure I continue with projects to bring you - while hes here. Though you are told in the military middeployment brief, "life is to go on as usual", who believes this? I mean, my world is stopping... LOL.. I do not want the 10 days to fly by like I want the rest of the week to ... honestly.. Its been 6 months from when I saw him and after these 10 days it will be another 6 before I see him again, but in all honesty, its been 10 months since hes been HOME... you know, the place that he has his tools, car, pillow and ME (AND THE KIDS.. I did mention them too right??? )... LOL..
Ok, enough of that... I know what you came here for, lets get to it. It was suppose to be Black, Grey and White, but I added Red, since it needed to POP! Its actually making its way to a friend who recently got engaged, after about 10 yrs of dating, and will be tying the knot June 2011! Inside of card - since they too shall be equally pretty! The polka dots paper comes from retired Rockabilly DSP from SU!, that I cannot part with, I use it sparingly, so if you receive anything with this paper, you should be lucky! I just love it. 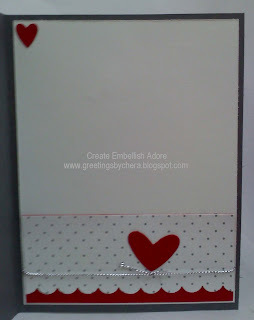 Added a button to the silver thread, and the Three hearts punch to create the red hearts. 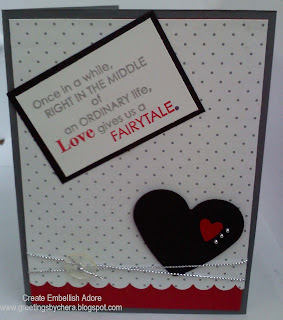 The large Black heart is also a SU punch, and then added silver beads to jazz it up alittle. Overall its exactly what I wanted! ... though I didn't quite get a sentiment in the inside, since I wasn't sure exactly what I say to someone who has to wait another 6 months to see her man, and ova a year till she ties the knot. So maybe just a CONGRATS ITS ABOUT TIME! Just kidding.. but I know if I do that, it might come back to haunt me.... so I won't... well.. maybe alittle!